Biblesoft is now offering a huge collection of Charles H. Spurgeon's lifetime works, including his complete sermon library, his expository notes, and a collection of many of his most important writings. This is one of the most complete Spurgeon collections that can be obtained anywhere. All of the bundles are integrated into Biblesoft’s unique and powerful Bible study system, allowing word search, access by book, chapter and verse (on most items) and access through Biblesoft’s global topical index. Note-taking and lesson development tools also integrate these works to the main library system to aid you in develop your lessons and articles. Take advantage of this opportunity to purchase the this collection at a great price! We also have a bundle that includes these titles plus Treasury of David and Geese in Their Hoods. Learn More. Often referred to as “The Prince of Preachers” and “England’s greatest preacher,” Charles H. Spurgeon had a legendary ability to hold thousands of people spellbound for hours. It has been estimated that he preached to upwards of 10 million people during his lifetime. Spurgeon’s sermons have been copied by preachers all over the world for generations. They have been widely circulated and remain one of the all-time best-selling sets of writings by a single author in publishing history. 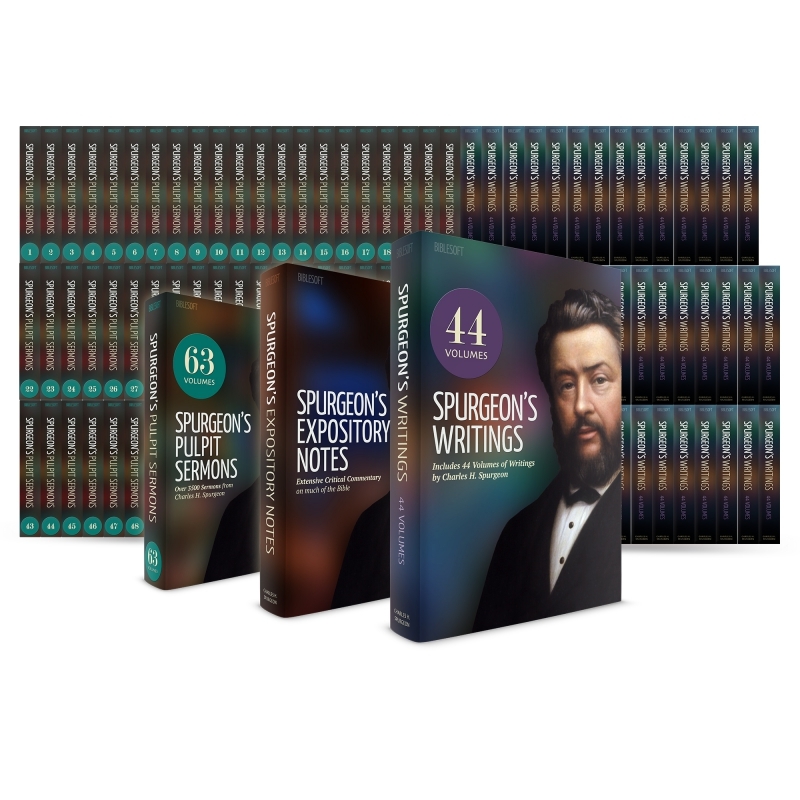 This set includes over 3500 of Charles Spurgeon’s sermons, delivered over his entire career preaching at London’s famous Metropolitan Tabernacle some of his earlier sermons from the New Park Street church. They are chronologically compiled. Many print editions are out with different collections of Spurgeon’s sermons, but due to the vast number of articles, only a digital library can efficiently handle a set which covers his entire career. Biblesoft’s unique study platform allows you to not only read and annotate the sermons, but search by word, scripture reference or by topic. In addition, links to the same scripture and topic run through all of your various libraries on the PC Study Bible. The sermons can be accessed (1) like a commentary, by book, chapter, verse, or (2) by a table of contents (book outline). The sermons are grouped by volume, with around 50 sermons in each volume, and arranged largely chronologically, according to the date they were delivered. Many Sermons (especially in the later volumes) include an "Exposition" section, which contains Spurgeon's notes on the passage which he delivered prior to the sermon. At the end of the 63 volumes, Biblesoft provides a unique alphabetical index (list) of the sermons (by title). Biblesoft has also produced a unique index of all the sermons listed in order by Bible passage. In recent years they have been pulled out and put into a sort of virtual commentary by the master preacher, covering much (but not all) of the Bible. His New Testament writings are particularly rich and comprise a large body of work. His comments are very extensive on New Testament books he often preached from, such as Romans. An example from Romans 1:15-16. Biblesoft’s unique study platform allows you not only to read and annotate Spurgeon’s commentary notes, but also to search by word, scripture reference or topic. In addition, links to the same scripture and topic run through all of your various libraries on the PC Study Bible. Have you ever felt “stuck,” searching for powerful ideas for a sermon, class, newsletter article, or a personal devotional topic? Biblesoft’s new selection of 44 miscellaneous books, treatises and tracts by Charles H. Spurgeon is like a fountain bubbling with ideas. Gleaned from one of the most prolific writers and speakers in Christian history, the collection will stir your imagination. This new bundle of works by the famous “Prince of Preachers” contains 44 volumes. Five volumes are selected and categorized Spurgeon quotations. Spurgeon’s classic book “All of Grace” is included as well as many lesser-known works. (For a complete list, check below). “The promises are the Christian’s Magna Charta of liberty; they are the title deeds of his heavenly estate. Happy is he who knoweth how to read them well and call them all his own. Yea, they are the jewel room in which the Christian’s crown treasures are preserved." Also included is Faith's Checkbook which includes a daily desktop devotional for PC Study Bible. Rounding out the set is Spurgeon’s six-volume work on classical Reformed doctrine, entitled “Doctrines on Grace.” Though not always a doctrinal preacher, in this series Spurgeon takes the principal tenets of Calvinism and goes into great detail on each of them. This bundle of miscellaneous works is in itself a great reference, and it can also be obtained bundled with the rest of Biblesoft’s Spurgeon offerings, including “Spurgeon's Pulpit Sermons (63 Volumes)” and “Spurgeon's Expository Notes” (Commentary). As always, many of these works are also accessible by Book, Chapter verse references and topical references.